Very Good. Sewn binding. Cloth over boards. 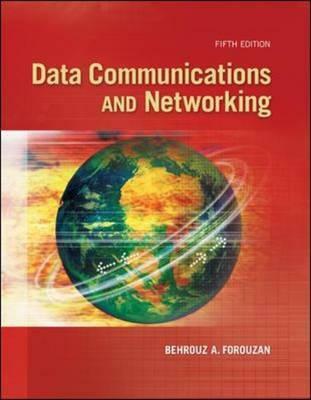 973 p. McGraw-Hill Forouzan Networking. Provides an introduction to networking technologies. This book is accessible to students from all backgrounds and uses figures to visually represent concepts. It reflects the constantly changing world of network technologies, and provides coverage of bluetooth, wireless, satellites, as well as four chapters on security. Very Good. 944 p. 700 figures. Intended for professional and scholarly audience. Intended for college/higher education audience. Provides a comprehensive introduction to networking technologies. This book uses figures to visually represent concepts and reflects the constantly changing world of network technologies, such as bluetooth, wireless and security coverage. It includes optional algorithm sections which allow instructors to adjust the level of math in the course. Good. 944 p. 700 figures. Intended for professional and scholarly audience. Intended for college/higher education audience. Provides a comprehensive introduction to networking technologies. This book uses figures to visually represent concepts and reflects the constantly changing world of network technologies, such as bluetooth, wireless and security coverage. It includes optional algorithm sections which allow instructors to adjust the level of math in the course.